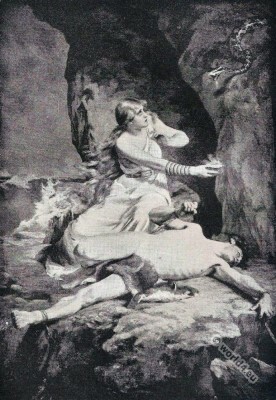 Loki and Sigyn. Northern Mythology. Home » Loki and Sigyn. Northern Mythology. Thorpe’s “Northern Mythology.’ Carl Gebhardt, Artist. Sigyn is a goddess from Norse mythology. Her name means victory bringer. She is the wife of Loki, with the share she has the son Narfi, and is a symbol of marital fidelity. Sigyn is mentioned in the Elder Edda (Völuspá 35), where they appear as sitting at her shackled husband Loki. Loki (also Loptr, Hveðrungr) is a character from the Edda poetry of Snorri Sturluson. Loki is one of the gods Aesir, although he is the son of jötunn, a giant. He is the most versatile of all the gods, but also the one with the most negative characteristics. On the one hand it helps the gods, on the other hand he also played tricks on them and deceives them. He makes use of his ability as a shapeshifter use and appears, for example, in the shape of a salmon or a fly. Due to this ambivalent role he is often interpreted as a trickster figure. Benjamin Thorpe 1782 – 1870, was an English scholar of Anglo-Saxon. This entry was posted in 19th Century, Fantasy costumes, Genre, Mythology and tagged Character sketches on 6/25/15 by world4.